While mostly a slick shade of black, the Ksholo is easily spotted and well known for it's bold neon stripes that run twice down the length of it's body. They have sensitive whiskers, and two fleshy barbs that hang off the corners of their large mouths. Their streamlined bodies make them fast in the shallow waters where they live, and their upturned noses help them root in sand and silt for food. 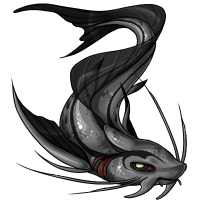 Ksholo also sport a long transparent back fin, and large front fins. Their eyes are clouded and they are said to have poor vision. Ksholo are solitary fish. They are often found half buried under sand resting in the quick flowing underwater streams. They are fast and fierce though when hunting or if disturbed, and are temperamental and territorial. Their large size and sensitivity to light makes them hard to care for pets, but if given a large shallow tank and a dark room they can make wonderful calm pets. Ksholo live in the shallow, cool, underwater streams that flow through the caves. 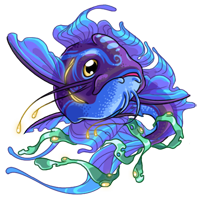 They prefer sandy bottoms to rock, and like water that is slow moving and are disturbed easily by faster currents.